No more golf bag hassles when gravity kicks in and your golf gear falls over onto the ground. 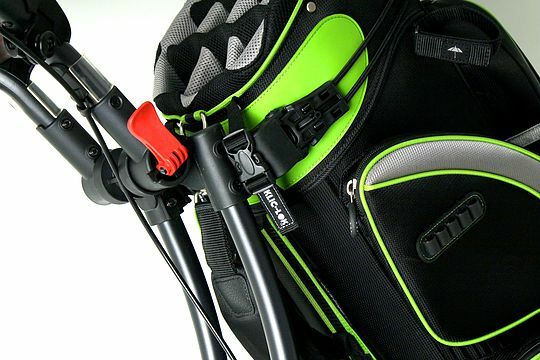 Eagles & Birdies have again come up with an industry first – the KLIC-LOK bag/buggy locking system. Simply connect the straps around the buggy cradles, pull to tighten and bag rotation ceases. Widespread testing was conducted covering 23 different buggy brands to fine-tune the KLIC-LOK system. It also has connectivity on both Club Car and Yamaha carts. The KLIC-LOK feature will also help reduce clubhead noise by reducing excessive rattling from bag movement on your cart or buggy. There are three new bag style – Augusta, Royal County Down and Magnetic Pro which all have the KLIC-LOK system plus other innovative improvements. Eagles & Birdies have screened more than 20 different buggy brands to find the optimum industry bag height standard. Within the three new KLIC-LOK bag styles there are 18 new vibrant colour combinations for the forthcoming golf season.